Shimp cocktail recipe with juicy ginger lime poached shrimp and a spicy Asian cocktail sauce. The origin of Shrimp Cocktail is a bit unclear. Some say it’s so named for the cocktail of condiments in the sauce, others say it’s because they are traditionally served in cocktail glasses–a clever repurposing of unused stemware during Prohibition. Whatever the case, Shrimp Cocktail is a quintessential retro American dish that’s undergone little innovation over the past century. At its best, Shrimp Cocktail is a titillating appetizer with plump juicy shrimp doused with lemon juice and dipped in a sweet spicy sauce that goes down kicking courtesy of the horseradish. Unfortunately, frozen precooked shrimp and jarred sauce make many experiences akin to dipping a spongy hockey stick into a vat of red corn syrup. I’ve updated the classic with Asian flavours, replacing the ketchup with a mixture of fresh tomatoes and tomato sauce, the Tabasco with Thai sweet chili sauce, and the horseradish with wasabi. To get the shrimp to fulfill their destiny, I gently poached them in a ginger, lime and cilantro broth which keeps them moist and tender. It’s not hard to do, and I think there are a lot of other interesting flavour combinations that could be employed here… plum with Sichuan peppercorns…. roasted red pepper with pimenton… Just make sure you use the best quality shrimp you can get, they are the centerpiece of the dish after all. Remove the shells from the shrimp being careful to leave the tail intact. Devein the shrimp by cutting a slit all the way down the back side (opposite where the legs were), and removing any brown stuff. Put the shells in a large saucepan along with the water, sugar, salt, cilantro, ginger, chili and lime peel. Cover and simmer for 20 minutes then strain the the stock. Add the strained stock back into the pan along with the sake and boil for a few minutes to burn off the alcohol in the sake. Add the shrimp to the hot stock, cover, then turn off the heat. depending on how large the shrimp are, they will need to poach anywhere from 8-10 minutes. 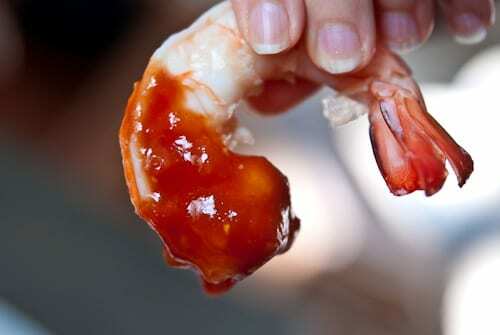 When the shrimp are cooked, plunge them into a bowl of ice water to stop the cooking. Drain and refrigerate until you are ready to serve (up to one day). For the cocktail sauce, put all the tomato, tomato puree, Thai Chili sauce, and fish sauce in a nonreactive pan and simmer over low heat until the tomatoes have mostly disolved into the sauce (about 20 minutes). Remove from heat and all the cocktail sauce to come to room temperature. Add the lime juice and wasabi and stir well to make sure there are no clumps of wasabi. Chill in the refrigerator until you are ready to serve. 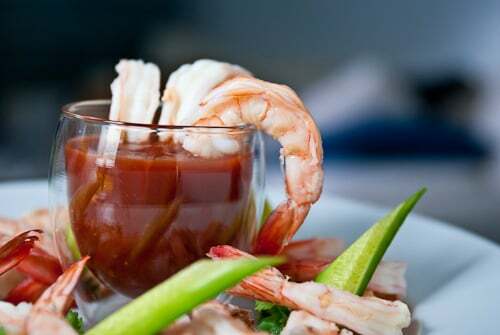 To serve, put a small bowl in the middle of a large plate, add the cocktail sauce to the bowl and lay the shrimp around the bowl. LOVE the Asian twist you gave to this very 70’s classic Marc! Another great photo. Love the light and colors. Nicely done. Good job on re-interpreting this old standard. It definitely needed doing. Now I want to try it myself. Yum! Nice photo. I really like that you replaced the ketchup with something closer to natural and the Asian flavors sound fantastic. Fresh and spicy. A great summer recipe. This recipe is being saved for my next Asian meal get together. Thanks so much! The cocktail sauce needs to be bottled. Sounds perfect. I’m in love with your sauce and I haven’t even tried it yet. I just know it’s going to better than the sticky sweet stuff with old horseradish. I love that a whole coriander plant goes into the stock (sorry, doesn’t feel right to call it cilantro) Sounds like a vast improvement on a much maligned classic! Oh what a wonderful idea! You could do a sauce themed on every cuisine…Mexican? Moroccan? But in this hot weather I agree Asian is absolutely the way to go. Hey Marc. Looks great. I was trying to figure out how to get the shrimp firm like it is in the steakhouses, and the secret is apparently brining. We made them the other night, brining them for 30 minutes first before poaching, and they were awesome. I’ve been making a lot of cocktail sauce lately for some parties, and instead of horseradish, I’ve also been using wasabi. It gives it a nice kick! I adore your knack for good photography. I try my best to learn how to cook and used to watch a lot of cooking programs on TV I used to see them using red/white wine. What is the purpose of using wine?. very nice coctail,, i lke to taste it…..
Prawns are my favorite, thanks for a great recipe.